Selling Plasma Cutting Machine, is a Cutting Machine that continues to provide extensive and flexible solutions with low investment and operating advantages, in line with production lines and automation, improving accurate cutting quality. The EPL series will be the center of profit for your workshop with maintenance costs and minimum usage and has not lost its accuracy for many years. PT. 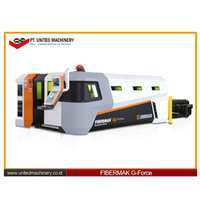 United Machinery Sell Plasma Cutting Machine with many machines that we have. Often used in fabrication shops, automotive repair and restoration, industrial construction, and rescue and demolition operations. Because of its high speed and precision cutting combined with low costs, Plasma Cutting Machine sees wide use from large-scale industrial applications to small shops. - Power Supply: Plasma power supply converts a single or three phase AC line voltage into a smooth and constant DC voltage ranging from 200 to 400VDC. This DC voltage is responsible for maintaining the plasma arc in all pieces. It also sets the current output required based on the type of material and thickness being processed. - Arc Starting Console: The ASC circuit produces an AC voltage of around 5,000 VAC at 2 MHz which produces a spark inside the plasma torch to make a plasma arc. - Plasma Torch: Function of a plasma torch to provide proper alignment and cooling of consumables. The main consumption components needed for the manufacture of plasma arcs are electrodes, swirl rings, and nozzles. Additional protective caps can be used to further improve the quality of the piece, and all parts are joined with the inner and outer retaining caps. Sell Plasma Cutting MachineTypes of cutting machines that are often used in fabrication shops, automotive repair and restoration, industrial construction, and rescue and demolition operations. Plasma Cutting Machine EPL 130.6 x 2The plasma cutting machine continues to provide a broad and flexible solution with low investment and operating advantages, in line with production lines and automation, improving accurate cutting quality. The EPL series will be the profit center of your workshop with minimum maintenance and usage costs and not losing accuracy for long years. 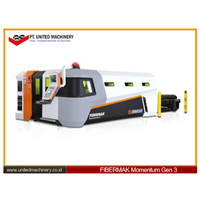 Laser Fibermak G-FORCEGENERAL FEATURESHigh acceleration of 2.5 G is presented optionally in the Gen-3 G Force servo Momentum series.Produces time decreases and productivity increases by an average of 15% per hour with high acceleration.Cutting Machines with FIBREMAK automation software and automation Momentum Gen-3 was developed by Ermax only engineers. Thereby;Your custom automation solution request can be appliedUpgrade software can be done for freeAutomation solutions can be added to the machine afterwardsReferring to the feedback of the machine, the upgrade can be appliedAfter sales support services can be provided very quickly via remote-access function.High quality laser sources and / or cutting heads can be used.Custom dimension bodies can be produced. 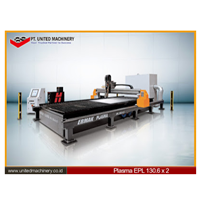 Anda Mencari "Plasma Cutting Machine"? 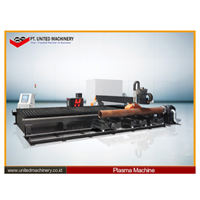 Buat Permintaan Untuk "Plasma Cutting Machine"
Plasma is defined in Webster as "a collection of charged particles containing the same number of positive ions and electrons and shows some gas properties but is different from gas as a good conductor of electricity ...". You can also think of it as an electrically heated gas stream. I like to think of it as a condition in which all electrons from each atom flow from atom to atom, not just orbit. Regardless of what happens in plasma flow, how to cut metal very easily. Take electricity flowing through the gas, and filter it through a small hole. Now the flow is very dense and moves very fast. The resulting flow can melt and blow up most of the metal easily. That's a plasma torch. Plasma cutting torches usually use a copper nozzle to constrict the gas flow with an arc flowing through it. The bow jumps from the electrode in the torch to another object - usually a conductive material that is cut. That is 'arc transferred'. There are several systems that use a 'non-transferred' arc where it jumps from the electrode back to the nozzle, but they are usually not used for cutting. So that means plasma cutting is only used for conductive materials, especially mild steel, stainless steel and aluminum. But many other metals and alloys are also conductive, such as copper, brass, titanium, monel, inconel, cast iron, etc. The problem is that the melting temperatures of some of these metals make them difficult to cut with good quality.